I was unprepared for how I would feel when she leapt into my arms. A small thin Haitian child my husband and I know mostly through letters and not so flattering pictures. And now I know where she lives. It took me two days to get to her; 3 planes to Port Au Prince, a small chartered flight to Port Au Paix, a boat ride to the island of Tortu, a hike up a hill to her village. When we arrived, the gate to her school opened with a buzz of excitement. Then she leapt. Smiles spread across our faces, tears flowed. We were filming a video, so for one day she was a celebrity. Cameras followed her as she played, studied, sang, and jumped rope, to show her in a day like every other. But it was a day like no other. 2 worlds collided in a single relationship. A daughter with no mom. A mom with no daughter. Lending healing to those unmet places in each other’s hearts. We hiked up a hill to her home, where her grandmother greeted us. She smiled and I saw she had no teeth. Her grandfather was perched in a chair in front of her house. He was blind. Dijinica was abandoned by her mother and father. They moved to the Bahamas when she was a small child and left her behind. Her grandparents had twelve children, so she had a myriad of aunts and uncles who still lived in her village. As the camera rolled, tears rolled softly down her cheeks for the brief moment she talked about them. The rest of the time, I observed a coating around her heart, reflected in her stoic personality. Until that beautiful smile spread across her face. How I wished I could have positioned it there permanently. To take the sadness from her life and melt it away with my sponsorship. But her story will be part of who she’ll become. 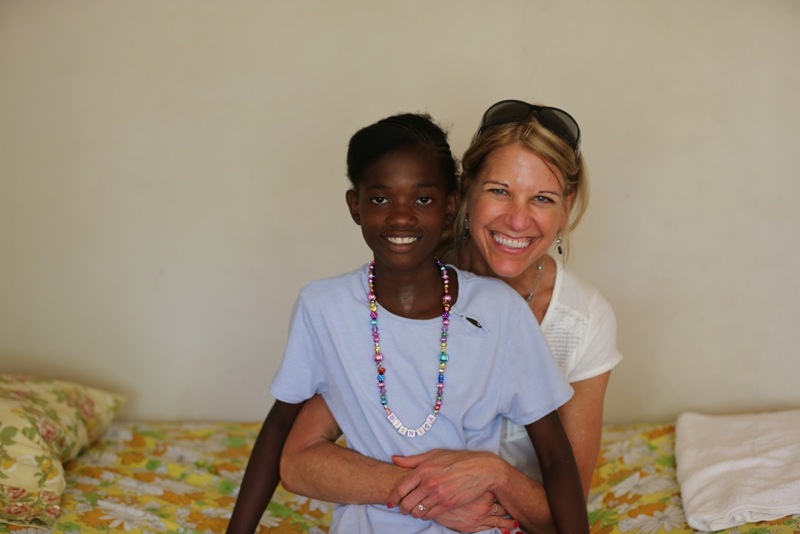 And God willing, our sponsorship will help her get there. Compassion sent her picture to me when she was seven. You get a picture and a number and a place to send your check and stationary to write your child and you know that child exists. You get more pictures as she grows. You write her when you can while you balance a job, your house, your family, your commitments and all the things you never get to in your overcrowded life. For your child, it is a different story. 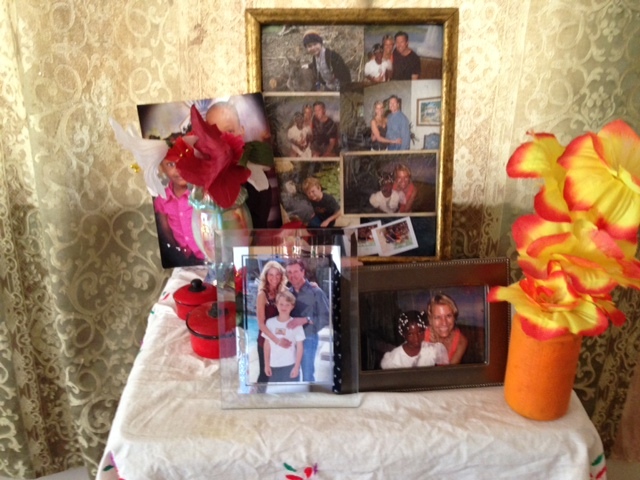 Dijinica had a single table in her home, and on it were pictures of my husband, my step son and me. We were the mom, dad and brother in this little girl’s life. For $38 a month, we had provided a meal, some clothes, and an education. What I didn’t know was that we had also inadvertently purchased a permanent place in this little girl’s heart. And now she has one in mine. When we walked down the long hill to goodbye, she couldn’t bring herself to look at me. I didn’t force her. I understood. Too many goodbyes in this little girl’s life. So I let her tears rolled down my cheeks. And now we carry her hope in our prayers. Our lives are bigger because of her. Wow – Lo, you just brought me to tears. Her tears roll down my cheeks as well. Such a beautiful story. Thank you for being who you are and touching lives the way you do. I love you. What an amazing story! Thank you so much for sharing this, Lo! Lots of tears this am. The way you shared the story, I could imagine being there and taking the journey with you. Thank you, Lord, for putting these two children of yours together! Beautiful! Thank you for sharing these powerful moments with us, Laurie. So clear that the Lord moves us into His heart, to join Him there. So painful, so real, so beautiful. Bless you! thank you Jamie! You’ve seen it first hand. What a beautiful story. Both in the reality and the telling of it. We sponsored a little boy once, so many years ago, but then trauma and crisis and divorce happened. I often wonder what happened to him and if our year of help made a difference. I pray it did. I still pray for him when I remember those days. It pulls at my heart and makes me long for the ability to bundle up an armful of children and bring them into our home. Lord willing, there may still be time some day. Thank you so much for sharing! You are such a blessing to her!